Back to school is cool with these bacon and banana flapjacks! What a delicious way to start the day or to enjoy as an after-school snack. Easy to make and easy to eat! First, make the batter for the bacon and banana flapjacks. Beat together the eggs and sugar until well combined. Mix half of the milk and the melted butter and add to the egg-sugar mixture. Using a wooden spoon, mix well to combine. Sift the flour, baking powder, salt and add to the wet mix. Mix well to combine; it may be quite lumpy. Gradually stir in the remaining milk to form a smooth mixture. Place in the fridge for a minimum of 30 minutes to thicken. Cut the bacon strips in half and cook under the grill until cooked and slightly crispy. Set aside to cool slightly. 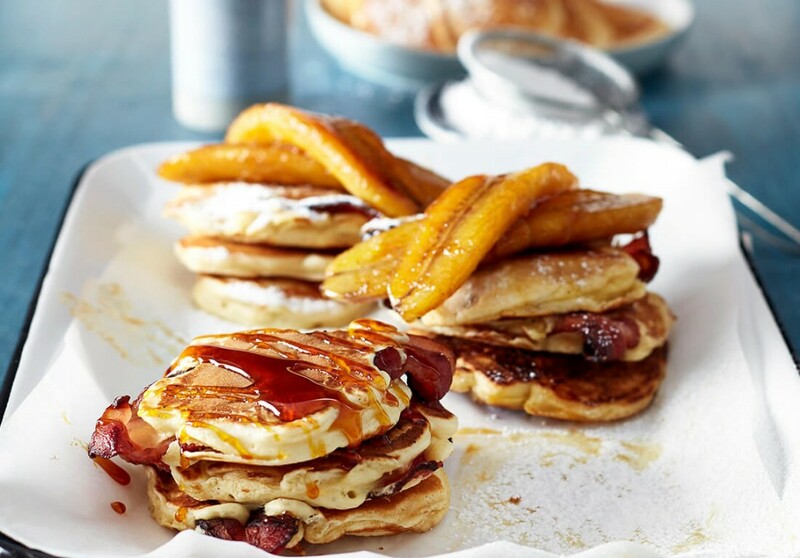 To make the crumpets, drop spoonfuls of batter into a greased heavy bottom frying pan, top with one piece of banana and one strip of cooked bacon. Top with a little more mixture to cover the bacon and banana. Turn once you see tiny air bubbles on the surface and flip over to cook the other side. To serve, drizzle with syrup and a light dusting of icing sugar.